Firstly, police threatened an activist with arrest for using the term “puppy killers”, saying it’s offensive. Next they were trying to obtain details from lawful protesters, which angered them when they were refused. The demo was so succesful with such a good atmosphere that passers by started to pap their horns, this was met with blue lights by the police who followed them, issuing £30 fines to the motorists. Among the animal ‘test models’ that Sequani imprison and experiment on are beagle dogs, rabbits, genetically stunted pigs known as ‘minipigs’, transgenic mice, chinese hamsters, rats and guinea pigs. These animals know no other life than that of which their captors have chosen for them; a life of imprisonment, misery, suffering, fear and death. 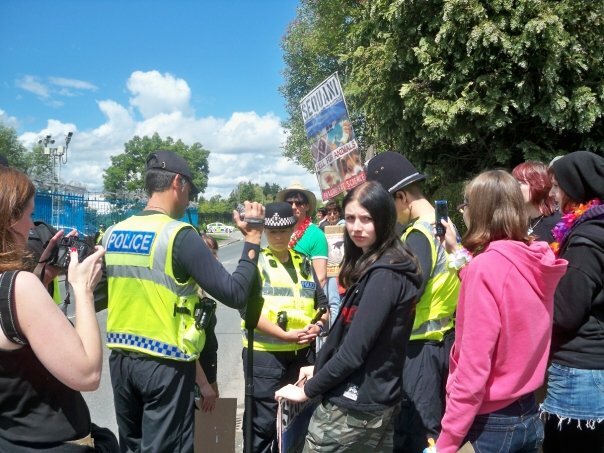 Protests held against Sequani vivisection laboratories in Ledbury, have spanned over the last 20 years. First focusing on the notorious Toxicol Laboratories UK in the 1980’s, then Quintiles England in the late 1990’s, now ‘Sequani Limited’. Different company names, same company registration number, same company location, same animal killers. In May 2008, Sean Kirtley was sentenced to four and a half years in prison after an 18 week trial which was at the time the longest running animal rights trial in history. He was found guilty of “conspiracy to interfere with contractual relationships so as to harm animal research organisation”.